Microsoft has issued a patch to fix a security flaw believed to have affected as many as 10,000 websites. The flaw in Microsoft's Internet Explorer browser could allow criminals to take control of people's computers and steal passwords. 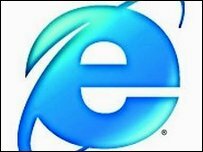 Internet Explorer is used by a majority of computer users and the flaw could affect all versions of it. However, so far the vulnerability has affected only machines running Internet Explorer 7. Security update MS08-078 would protect customers from active attacks against Internet Explorer, said the US software giant in a statement accompanying the release of the update. "This update will be applied automatically to hundreds of millions of customers through automatic updates over the next few days," said Mike Reavey, director of the Microsoft Security Response Center (MSRC). According to Rick Ferguson, a senior security adviser at security firm Trend Micro, the flaw has so far been used to steal gaming passwords but more sensitive data could be at risk until the security update is installed. "It is inevitable that it will be adapted by criminals. It's just a question of modifying the payload the trojan installs," he said. It is relatively unusual for Microsoft to issue what it calls an "out-of-band" security bulletin and experts are reading the decision to rush out a patch as evidence of the potential danger of the flaw. Some experts have suggested that users switch browsers until the flaw is fixed. Firefox, Opera, Chrome and Apple's Safari system are not vulnerable to this current flaw. But Graham Cluley, senior consultant with security firm Sophos, said no browser is exempt from problems. "Firefox has issued patches and Apple has too. Whichever browser you are using you have to keep it up to date," he said. "People have to be prepared and willing to install security updates. That nagging screen asking if you want to update should not be ignored," he said.